For 37 years the 747 Jumbo Jet held the record for passenger seating and until the start of service of the A380 it was the largest passenger jet in the world. The Boeing 747-100 was the first of the family of 747s developed and manufactured by Boeing. It carried a maximum of 550 in a single class configuration. It was more than two and a half times larger than the next largest Boeing transport the Boeing 707-320. With a standard 2 class arrangement it could carry 452 and with a 3 class arrangement it carried 366 passengers. The Boeing 747 was introduced about the same time as two other heavy airliners, the Douglas DC-10 and the Lockheed L-1011 Tristar. However the 747 was much larger than the other two heavy airliners and was for 37 years in its own class of airliner. 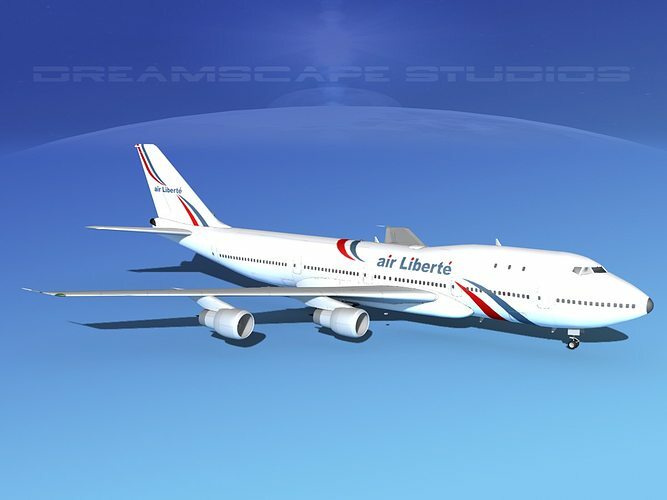 The 747 development continued with the -200, -300, -400 and latest the -800 or -8I version. The 747 has a cruising range over 5000 miles and a cruising speed over 550 miles per hour at 35000 feet. The different versions do have improving numbers of cruise, payload and range with newer versions. This model is built near to scale and is fully textured. This model includes all the textures and materials as shown here. The model includes many animateable features including flaps, ailerons, elevators, rudder, landing gear, landing gear doors and turbines. This model is provided here in many formats for your convenience and immediate downloading.